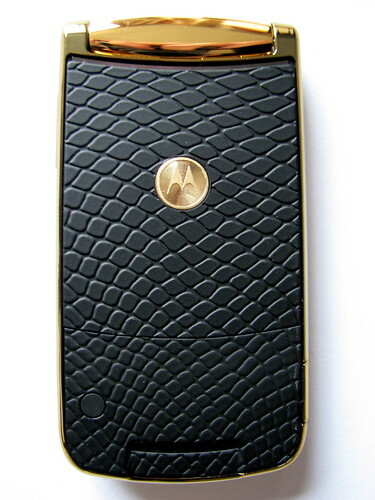 The RAZR2 V8 Luxury Edition from Motorola is a combination of engineering and elegant design. 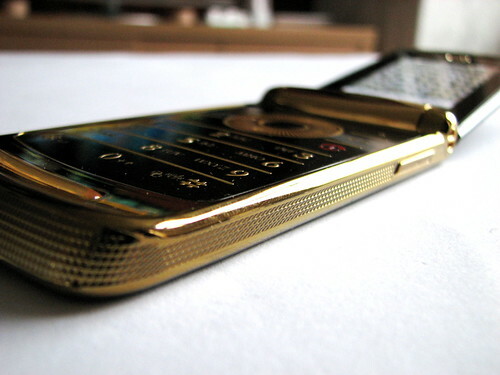 Using the classic RAZR chassis, Motorola have taken one of the most popular phones of recent years and given it a makeover with an 18-carat gold trim and a snakeskin texture on the back. 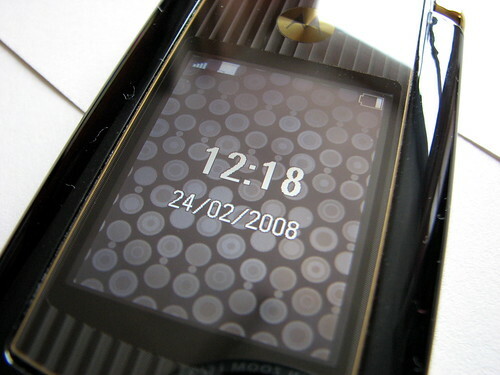 With the RAZR-slim design measuring in at just 12.05mm, the V8 Lux remains as thin as the day it was born and now comes with a 2.2-inch screen on the inside and a 2.0-inch screen on the exterior. However there is a price to pay for all this luxury, with prices hitting as high as £500. 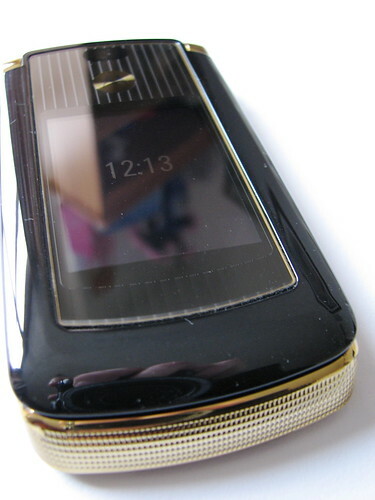 For that you get a luxurious handset that is solidly built and screams to be looked at. Everything is in the details with the V8 Lux. 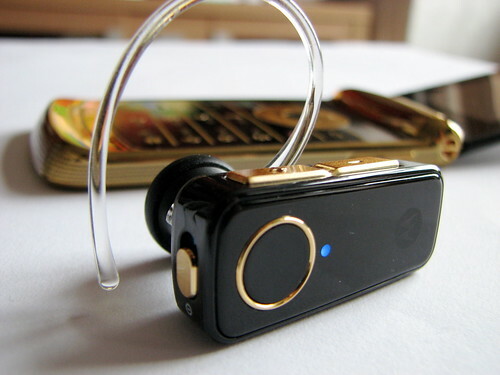 The first thing you’ll notice about the design is the gold trim it has, complemented by glossy black. Take a closer look at the sideband and you’ll notice the cut is sharp and precise, then move your eyes over to the navigation wheel with its laser cut finish and you can start to appreciate the amount of time that has gone in to the details that make this phone so special. When you hold the V8 Lux in your hand, it doesn’t creak or bend. It’s completely solid, which for a device this slim, is impressive. This only reinforces the effort that has gone in to the build quality. The snakeskin back is a nice finish to what would otherwise be a plain black shell, and although its not real snakeskin, the effect is there and the feel is authentic. Inside you get 2GB of onboard storage, Bluetooth wireless, Opera Mobile Browser 8.5 and fast USB 2.0 transfer speeds for downloading your movies and music tracks. A 2 megapixel camera is built in to the lid of the handset and allows you to take shots or shoot video. From a usability perspective, the question is still out as to how useful it is to have a clamshell handset these days. When closed it offers a compact form factor that makes checking the time, missed calls and messages very quick and easy. The V8 Lux has one of the largest exterior displays of any clamshell handset and meets the same spec as the one on the inside. With the handset closed you can use the buttons on the side to view your messages and missed calls. You can also reply to messages without opening up the handset using the defined template replies. Simple, handy and effective for times when you need quick access to your messages. When you open up the clamshell handset, you’re greeted with a nice bright display and large keys. I spent a few weeks trying to get used to the keypad but something just didn’t click. I’m quite nippy when tapping out messages using T9 predictive text, but with the V8 Lux I didn’t feel like I was moving as quickly and I think that is down to the size and travel of the keys. The V8 Lux is quite deceptive in that when its closed it takes up a very small footprint. When fully extended, it becomes a very large handset. The Midas touch doesn’t stop at the exterior. 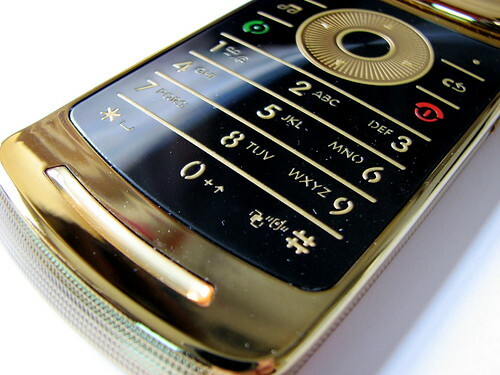 Delve in to the software and you’ll find that Motorola have provided some customised themes to match the gold design. Other than the customised colour schemes and wallpapers, there’s not a lot more that can be said about the software. One of the key ingredients that is skimped on with ‘skinny’ phones is the battery life. The V8 Lux is no stamina phone but it holds its own. From full charge I was able to get three days of regular useage including text and phone calls. The only issue I have with the battery is the time it takes to charge. The handset recharges through the mini-USB port on the side and takes up to three hoursto charge up from flat. I’ll be honest and admit that not everyone I showed this phone to could say they loved the design. Some were pleasantly surprised, some called it out for being over the top. I like it. For one it’s not outrageously ridiculous. It’s logically justifable. The premium design and the fact that not everyone will want it makes it even more unique when you pull it out to answer a call or tap out a message. This is a phone that will definitely get you noticed.